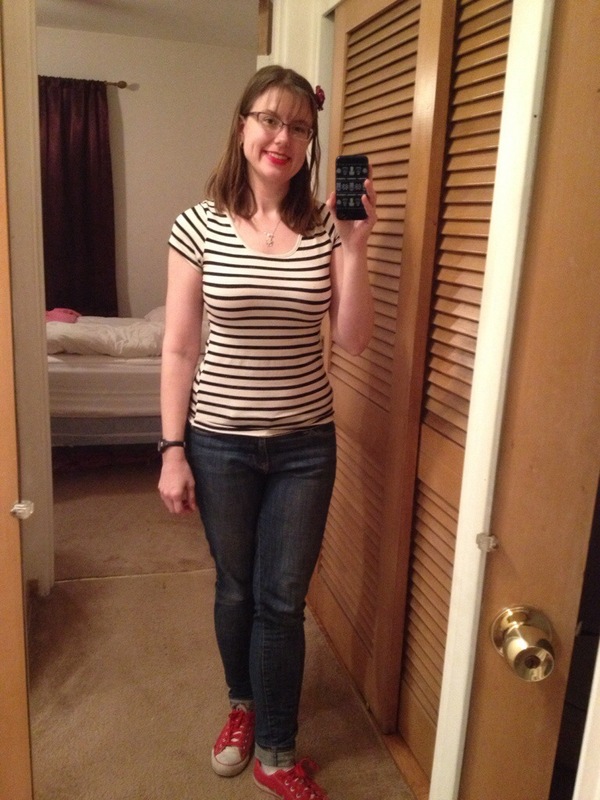 Stacy missed my saddle shoes, so I pulled them out for Friday! I hadn’t realized I went brand heavy until now, ha! It’s been warm and humid but still in the 80s. Not quite sleeveless weather. Weird summer. Apparently the same thing happened in 1947, super cool in June, July and early August, but then bam, record number of 100s to finish out the month. I’m hoping we don’t have that twist! 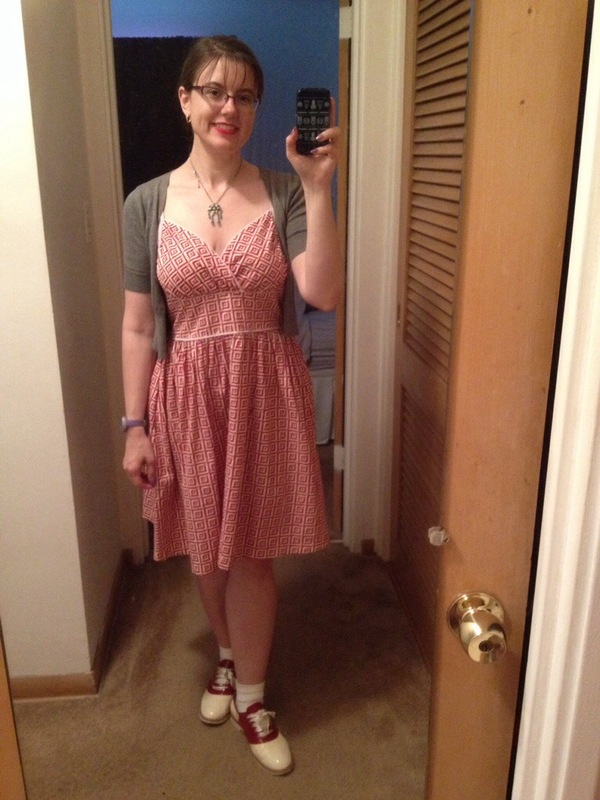 This is my Modcloth surprise dress from last fall – it hasn’t really been warm enough this summer to wear it. I decided that I didn’t care. It’s pretty comfortable and was fun to wear. 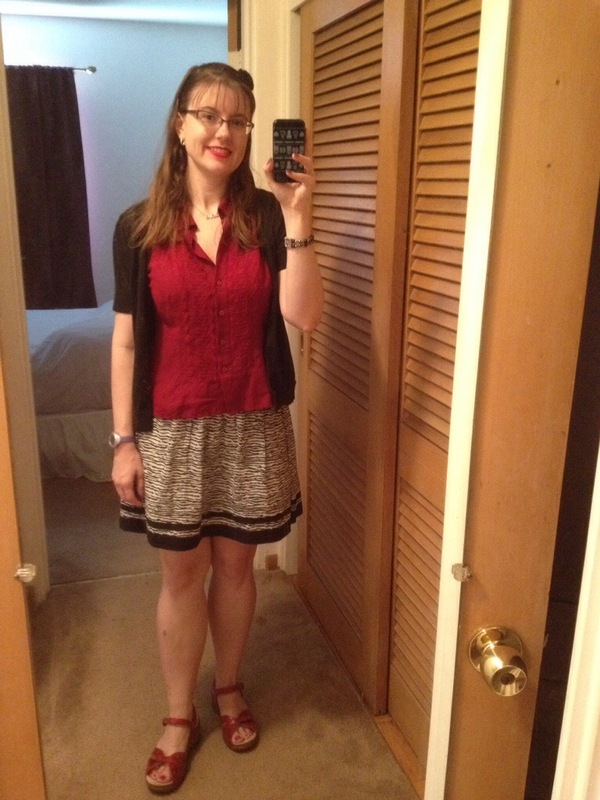 I spent most of the day sans cardigan, too, until it just got too chilly in the a/c. I have been on a major Lush renaissance again. I pulled out my Let the Good Times Roll, which is my favorite and smells so damned good. I need to get a new one, though. I also want to get some soap and maybe a scrub? I always like Buffy, but I’m thinking maybe Aqua Mirabilis? I also spent a good chunk of time Friday reading Lush Spa reviews – so far, they’re only in NYC and Philadelphia stateside, but I hope they move westward soon. Even cheap me would shell out lots of money to visit multiple times. I’m debating going tomorrow, I have off, but I have plans for the mall with a coworker in two weeks, so. I also have things I should do tomorrow. We’ll see what wins! Hello, friends! I hope you all had a merry week. I had an overall relaxing holiday break, which was lovely. Gift wise, I’m super pleased with my new sweater and skirt from my parents – I dropped the sweater off at the dry cleaners today, but they wouldn’t take the skirt because they say the trim could crackle. So I am going to attempt to wash the lining myself, I guess, heh. We’ll see how it goes. I also got a great new Haiku purse, my third. I sewed my brother a pillow using fabric that told the story of A Charlie Brown Christmas and it was a big hit. Now I need to find some non-Christmas fabric to make cases he can use year round! I met my childhood best friend for lunch today – we’ve been friends since we were 4 years old, but haven’t seen each other in person since college graduation. We spent hours catching up and it was lovely. Did you notice what is new?? Glasses! I finally made my decision and went with the Character Studies. They are a bit snug behind my ears, but I asked their personal shopper Ritzy for advice and she said I can use a hair dryer to heat them and bend them out a bit. I’m going to wait to do that until I have assistance, but it sounded pretty easy in her email! 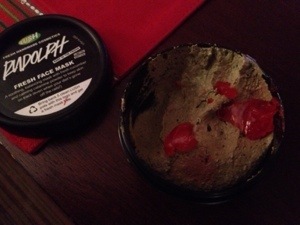 Before I went home, I had to stop at Lush to trade in five empty black pots for a free face mask. I’m so glad I went with the sales lady’s recommendation of Rudolf – it was very soothing, and yes, the red aloe goes on your nose, hee. Also of note was the amazing pumpkin pie my dad made. My brother has a lot of allergies (wheat, soy, rice, etc etc etc) which means baking especially is a challenge. 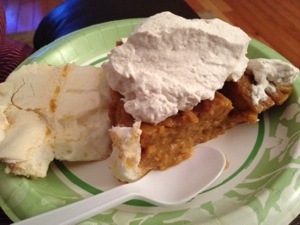 Dad found a crust that is actually a meringue and then made pumpkin pie filling. SO GOOD OMG. It’s also topped with his homemade cinnamon whipped cream, yum. One thing I do every year is participate in an ornament exchange based on the Betsy-Tacy book series. We send ornaments in character to each other as another character. 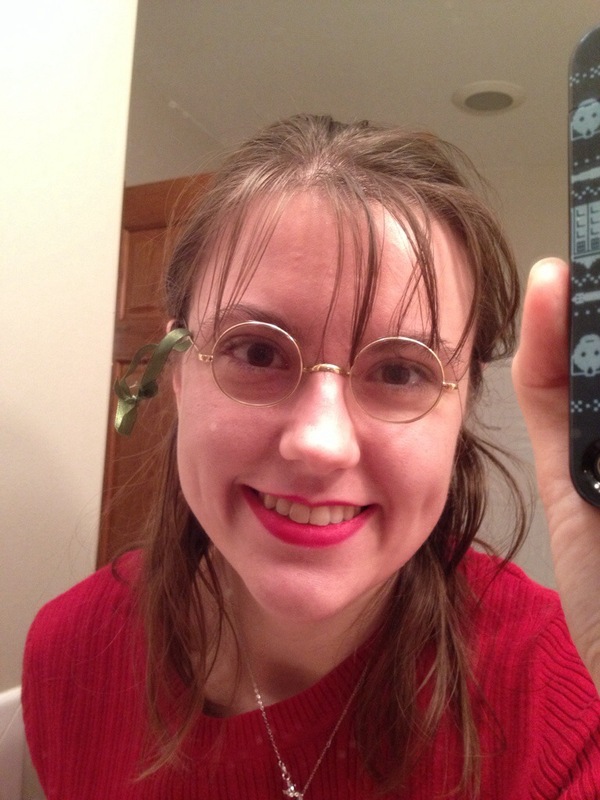 This year, my sender found this amazing pair of real vintage glasses that look just Carney’s, from the books, and looped a green ribbon around the arm for hanging. The glasses are absolutely tiny – they fit inside mine with lots of room to spare – but the store owner promised that they were actually made for an adult woman. So clearly the answer was to try them on. 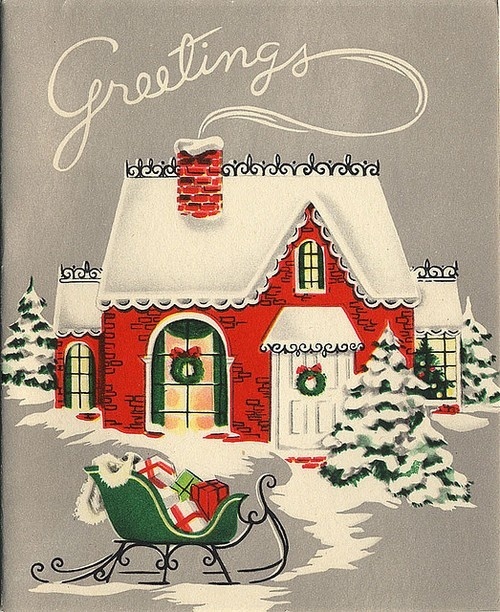 What were some of your holiday highlights? First, a revelation. You GUYS. Sebacious Filaments are a thing. They are not blackheads! They are permanent and not actually a problem. (Google image examples.) This sort of blows my mind and changes my perspective. Last time I was at Lush, I grabbed a sample of of Dark Angels for my mother and I. I used Angels on Bare Skin for a very long time and it always was lovely. This is a little stronger, a sort of sugar scrub, and it did a fabulous job exfoliating. (Also, a sample pot gave us at least 4 uses, which, wow. You don’t need a lot.) I don’t think this is a good every day for me, but once or twice a week? Wow. Good things for my skin. It did even more for my mother’s. I also grabbed some Sacred Truth, which isn’t my favorite fresh mask (either Love Lettuce or BB Seaweed), but it does a great job cleansing and moisturizing. I love Lush. So I hit JCrew at the outlet mall last week. 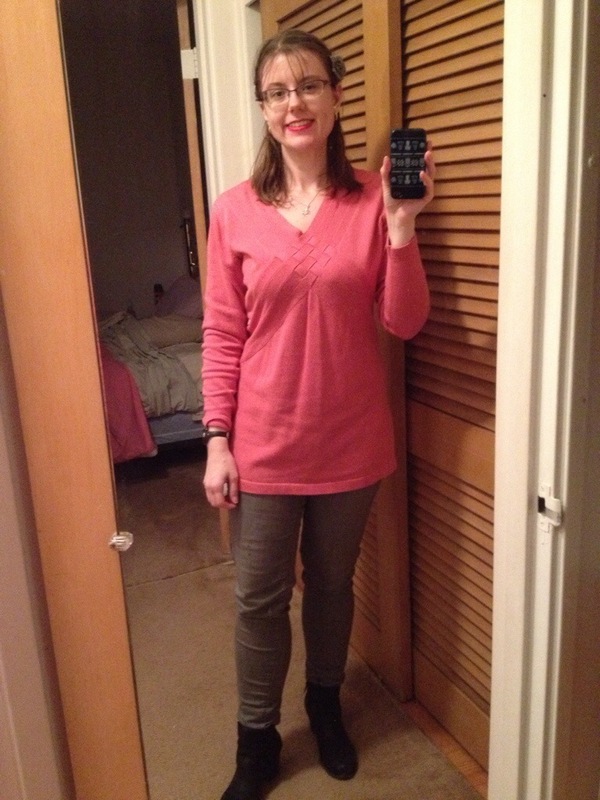 I’ve always liked the look of their matchstick jeans, but didn’t think that they’d fit me. I was sort of right, but not really. I first grabbed 30s, and they fit, but so well that they’d probably be big as they stretched through the day. I also thought they widened too much at the ankle. I tried the matchstick cords and preferred the cut but they puddled at the ankle (and they were cranberry and I wondered if they were too 70s). I think in the end, a 29 short would have worked in either, but I did not find those and I was getting annoyed. 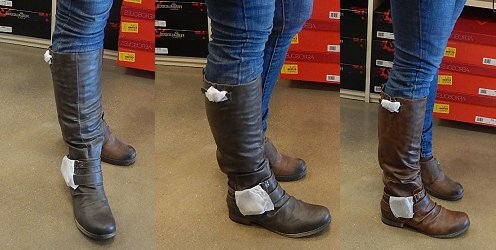 I also hit Famous Footwear and found boots that I loved, but they felt too tight in the ankles. The ANKLES! I mean, wtf? They were so cute. Santana boots in taupe and cognac. I also tried on Aerosole Roller Rink heels I’d been eyeing for awhile, on sale for $50, but I wasn’t totally sold on them. I think I’m going to try and replace the insoles of my current Aerosole mary janes before replacing the shoe entirely. We’ll see. And in the end, I bought yoga pants and two pairs of tights. Sigh. So happy to wear my new skirt! The snow was a bit of a bust – some of the grass was a little covered when I woke up, and my car was covered and iced shut, but that’s it. SIGH. You guys, this skirt is so awesome! So comfortable, so cute, I love it so much. I am super excited. Also making me super excited: it’s Christmas bath day! I will plop in a delightful bathbomb or bubble bar from Lush (possibilities: Father Christmas, Rocket, Golden Wonder) and I will put in my CD of the 1940s radio performance of It’s A Wonderful Life (and maybe Miracle on 34th Street, also at that link). I am not a huge fan of the IaWL movie, but the radio broadcast is just perfect. I just have Christmas stocking errands to run before I can do that, so I better hurry off and get dressed! After wearing green for this month’s Every Body, Every Wear, I decided to mix it up for the holiday itself. 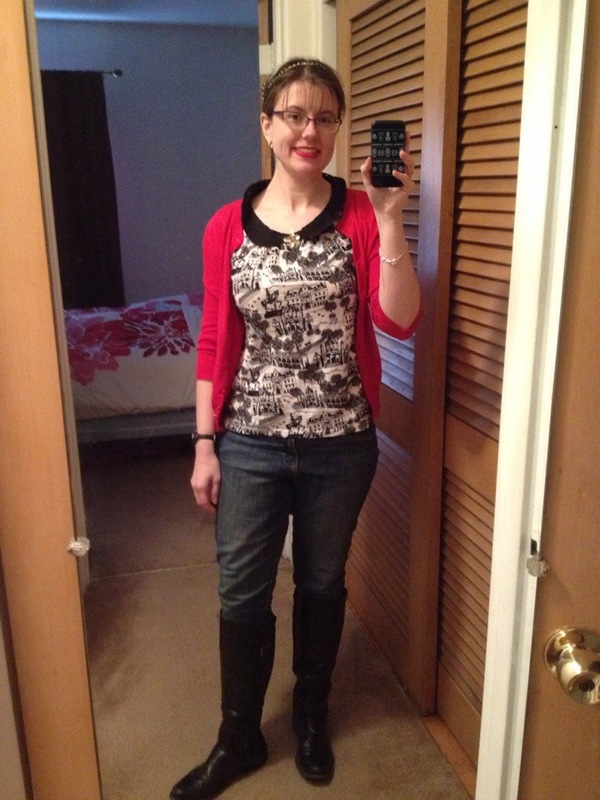 I could have sworn this top was kind of fitted, but I was quite off on that. Maybe it hangs differently over jeans. But I like the peplum created by the belt. After work, I headed out to my friend’s super fun birthday dinner and ended up staying longer than planned. I finally got home around 11, crashed and spent today on the couch with Mad Men and The Help. I am now, obviously, trolling etsy for adorable 1960s dresses. I also tested out Lush’s new dry shampoo, No Draught. 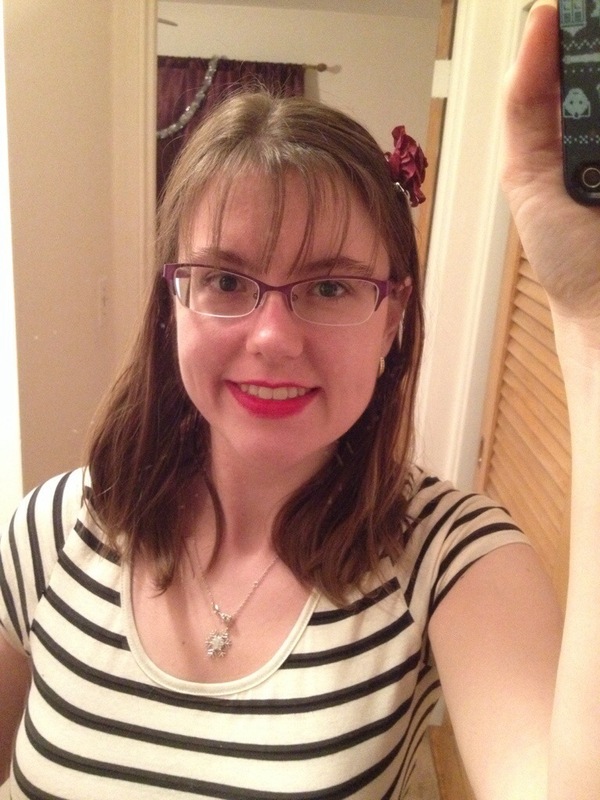 I’ve never tried a dry shampoo before, but I am in love – after a full day, I still have no oil. Considering how often the water in my building goes out, this is entirely awesome.